Here you will come to know about the Sindh Educational Endowment Fund Scholarships 2019-20 College Education Department Latest from this website. Government of Sindh is providing scholarship to those students who are poor and can not afford the expenses of their studies. All students who want to get financial assistance can apply for these Scholarships on need and merit basis. All students who are enrolled in any government college or university can apply for this scholarship program. Currently the scholarships are being awarded to those students who are enrolled in Business Administration, Information Technology, Medical or engineering programs can apply for this scholarship. 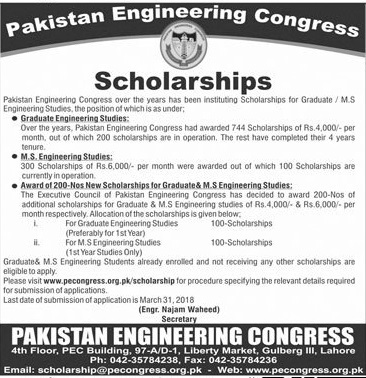 Only those students can apply who belongs to following universities which are mentioned in the below advertisement of this scholarship. If you are also eligible to apply for this scholarship than apply as soon as possible because if the last date will be pass then you will not be able to get this scholarship. So get all the latest details about this scholarship. All candidates who have got admission in any of the below mentioned university can apply for this scholarship program. Only those candidates who belong to Sindh or have Sindh domicile can apply for this scholarship program. Both male and female students can apply for the scholarship and scholarship will be given on merit basis. Those students who are full time student and their parents have annual income less then 12,00,000 are eligible to apply for this scholarship program. All scholarships will be given on merit basis however there are 5% seats are reserved for the children of government primary, secondary and higher secondary school teachers. Al late arrival and incomplete applications will be rejected by the officials of this department. So apply as soon as possible because the last date it ahead and after last date the application will not accepted. Last date to apply for this scholarship program is 31 December 2019. All students who are meeting with the above criteria can apply for the scholarship on merit basis. All candidates can get the application forms from the officials of this department or can be download from the official website. It is also available to your college or university too. After getting the application form you can fill the application according to the details and can submit the application form along with all documents before last date. All the details are mentioned on the application form and it is must to follow those instructions. If you have any question in your mind regarding to the Sindh Educational Endowment Fund Scholarships 2019 College Education Department Latest than you can ask from us. You can also visit the officials website of this scholarship department too. One thing that you should know is that the last date to submit the application is 31 December and after this date application will not accepted.